Bothwell, Robert. "John Turner". The Canadian Encyclopedia, 28 April 2017, Historica Canada. https://www.thecanadianencyclopedia.ca/en/article/john-turner. Accessed 18 April 2019. John Napier Turner, PC, CC; sprinter, politician, lawyer, prime minister (born in Richmond, England, 7 June 1929). Turner is best known for his early political service as federal justice minister and finance minister, and for the 1988 free trade election battle with Prime Minister Brian Mulroney. Turner's 11-week term as prime minister is the second shortest in Canadian history, after Sir Charles Tupper (10 weeks). Following the death of his father, Leonard Hugh Turner, John – at about the age of four – accompanied his Canadian-born mother Phyllis [nee Gregory] to Canada in 1932. The family settled in Ottawa where Phyllis, an economist, became a senior federal civil servant. After attending Ottawa private schools, Turner moved to British Columbia with his mother and stepfather, Frank Ross, at the end of the Second World War. (Ross would become lieutenant-governor of BC in 1955, and Phyllis would serve as chancellor of the University of British Columbia, UBC). Turner studied political science at UBC, where he excelled in athletics. In 1947 he became the fastest man in Canada, setting the Canadian record for the 100-yard dash (9.8 seconds). The following year he ran his personal best (9.6 seconds), and qualified for the 1948 Olympic Games – but was unable to attend the Games after injuring his knee in a car accident. Turner went on to study at the University of Paris, and at Oxford University, where he earned his law degree in 1952 as a Rhodes Scholar. He returned to Canada and joined a Montréal law firm, qualifying as a lawyer in Québec in 1954. Turner married Geills Kilgour in 1963. They have four children. Recruited by Prime Minister Lester Pearson as a Liberal candidate in Montréal, Turner was elected to the House of Commons in 1962 (and re-elected in 1963 and 1965). When the redistribution of federal ridings abolished his seat, he moved in 1968 to an Ottawa constituency. He first entered the cabinet in a post-election shuffle by Pearson in December 1965, and served in minor offices until becoming minister of consumer and corporate affairs in December 1967. In 1968 Turner ran for the Liberal leadership following Pearson's resignation. Although he lost to Pierre Trudeau, Turner made a respectable showing as an "anti-establishment" party candidate and as the most prominent younger English-language minister. Trudeau appointed him minister of justice in July 1968, a position Turner held until January 1972. In this capacity Turner sponsored Criminal Code reform and special legislation that followed the 1970 October Crisis. In 1972 Trudeau transferred Turner to the Department of Finance. When the Trudeau government lost its parliamentary majority in November 1972, Turner found it necessary to tailor policy to the demands of popularity, and tax reductions and pension increases followed. The government still ran a surplus, both in 1973 and 1974, but the overall effect of its policy was to stimulate inflation. After the Trudeau government regained its majority – in an election triggered by the defeat of Turner's May 1974 budget in the Commons – Turner concentrated on restraining inflation. However, he wanted to move on from the finance portfolio. In 1975, reports surfaced in the press that Turner was considering quitting both the Trudeau government and federal politics entirely. He and the prime minister discussed the issue in July – with Trudeau suggesting that Turner take another cabinet post, or remain in the government for at least another year. The meeting ended without a clear decision. The two met again in early September. By this time, Turner had decided that the Trudeau government had an unrealistic assessment of the country’s economic situation and the mood of the voters. He felt the prime minister hadn’t given Turner's financial policies sufficient support, and was not providing effective leadership. Perhaps most importantly, Turner saw no possibility of taking over the leadership of the Liberal Party in the near future. On 9 Sept., he submitted his letter of resignation to the Prime Minister’s Office. Turner’s sudden departure from cabinet was a bombshell that dominated national headlines. Although Trudeau’s supporters presented Turner’s resignation as an act of disloyalty, others saw Turner as the wronged party. The media praised Turner’s work in the ministries of justice and finance. The consensus was that he had resigned because he couldn’t convince his colleagues to reduce government spending. Turner's resignation hurt the federal Liberal Party, and may have been a factor in Ontario Liberal leader Robert Nixon’s provincial election loss to Progressive Conservative Premier Bill Davis that September. There was subsequent speculation that Turner might seek the leadership of the Ontario Liberal party, or even change political colours and make a bid for the leadership of the federal Progressive Conservatives after the resignation of Robert Stanfield. However, in February 1976, Turner quit politics altogether. He joined a large Toronto law firm, and joined the boards of directors of a number of Canadian companies. Turner declined to put his name forward as a candidate for the Liberal leadership in 1979 after Trudeau's first, brief resignation. A leadership contest was never held, due to Trudeau’s abrupt return ahead of the 1980 election. 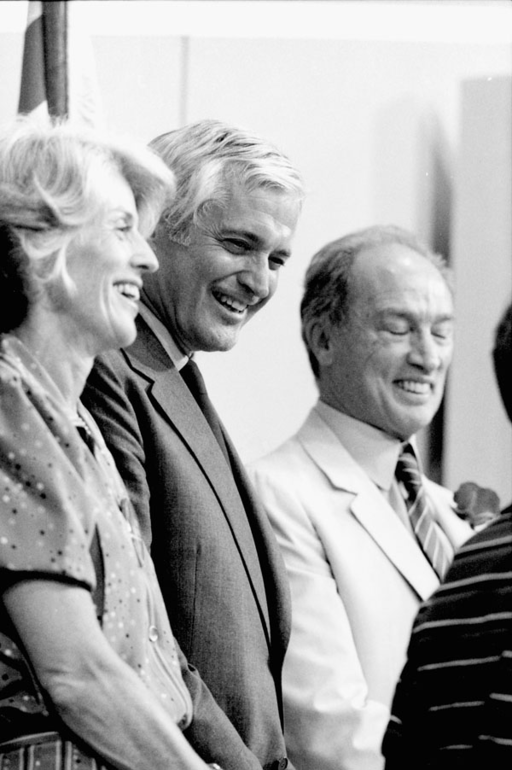 John Turner at the Liberal Party leadership convention in 1984, flanked by his wife Geills and by Pierre Trudeau. Four years later, with the announcement of Trudeau's resignation, Turner decided to try for the leadership, which he won on the second ballot on 16 June 1984, defeating fellow candidate Jean Chrétien. As leader of the governing Liberal party, Turner automatically became Canada’s 17th prime minister on 30 June. He wasn’t required to call an election until 1985, but with the Liberals leading in the polls, he decided to have Parliament dissolved on 9 July. A federal election was called for 4 September. The Liberal lead slipped as Turner made several major gaffes during the summer campaign. He was criticized for wanting to create jobs via “make work projects” – a 1970s label, which itself was indicative of Turner's outdated campaign style and conduct. 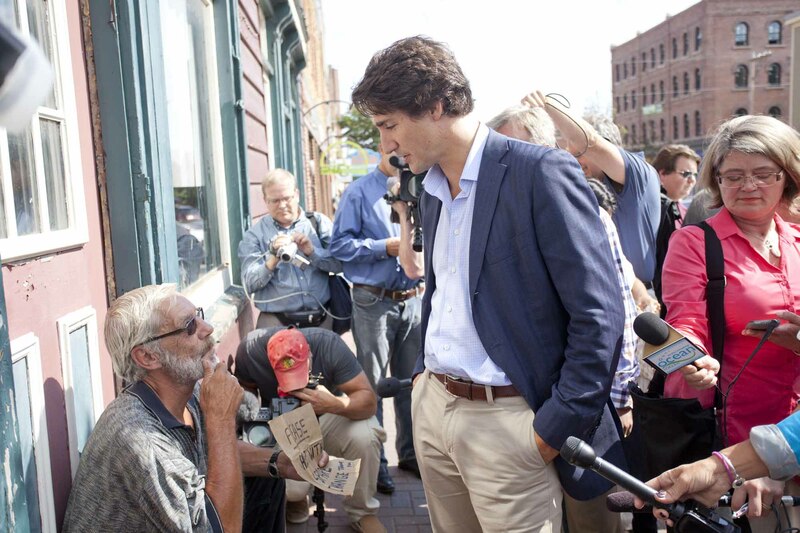 He was caught on camera patting Liberal Party President Iona Campagnolo on the posterior. He tried to defend the act as a friendly gesture, failing to realize that many women saw it as condescending. 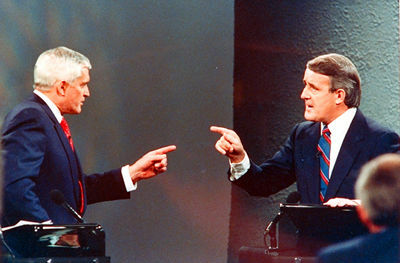 John Turner and Brian Mulroney during their acrimonious television debate (photo by Fred Chartrand). The Liberals suffered a massive defeat, reduced to only 40 Commons seats after losing many ridings in their traditional stronghold of Québec. Turner won his own seat in Vancouver Quadra. He left office as prime minister on 17 September, and began four years as leader of the Opposition. Amid much internal discord, Turner rebuilt and revitalized the Liberal Party. He was reconfirmed as leader at the party convention of 1986, and the Liberals were again leading in the polls by 1987. The defining issue of the 1988 election was the Free Trade agreement which the government of Prime Minister Brian Mulroney was negotiating with the United States. The agreement would abolish most tariffs at the Canada-USA border and establish a new process for dealing with trade disputes. Corporate interests solidly supported the agreement. Opposing it were labour unions, the arts community, and Canadians who feared that their national sovereignty was at stake. 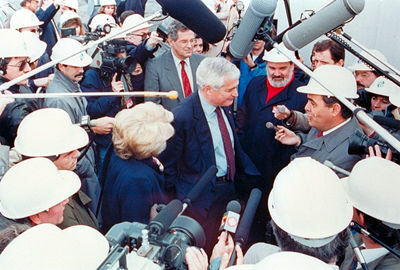 Liberal leader John Turner surrounded by reporters during the 1988 election campaign. Turner accused Mulroney of selling out Canada to the United States, and declared that his battle against the agreement was “the fight of my life.” The Liberals more than doubled their seats in the election, taking 83 ridings, however, Mulroney won a second majority government and the Free Trade agreement was ratified. 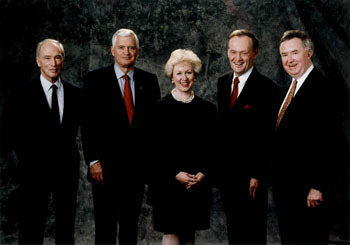 Turner resigned as leader of the Liberal Party in 1990, replaced by Jean Chrétien. Turner kept his seat in Parliament until 1993, however, he was rarely seen in the Commons. In 1990 he returned to private practice, this time as a lawyer at Miller Thomson LLP. He eventually became head of the law firm’s scholarships program. He also sat on the boards of several corporations. In 1994 he was made a Companion of the Order of Canada. 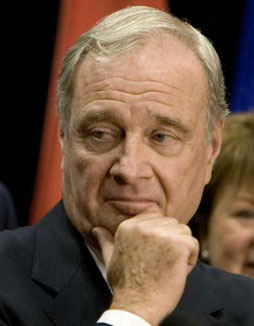 In 2004, Turner was a member of the Canadian delegation that monitored the Ukrainian presidential election runoff vote. 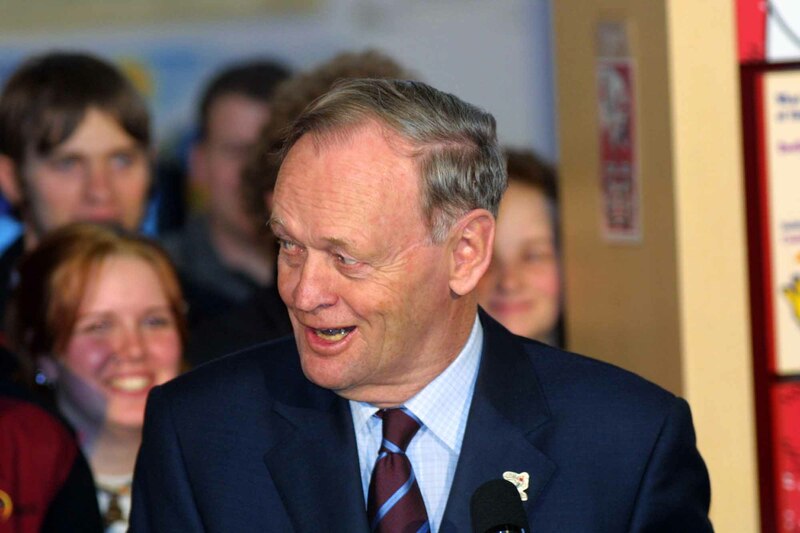 He participated with other former prime ministers in the television reality series Canada’s Next Great Prime Minister in 2008. In 2012, Turner was awarded the Queen Elizabeth II Diamond Jubilee Medal for Canada.